The songs that you hear are the traditional Doukhobor singing from the 1950s and earlier. 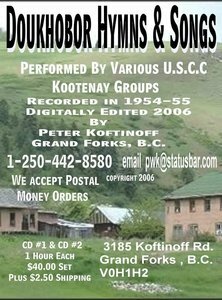 The singing of Doukhobor hymns and songs in the years of 2000 and up have been altered considerably. Older people who hear the old (50s) singing are amazed at how the singing has changed. Peter Koftinoff of Grand Forks B.C. was commissioned by the CBC Radio in 1954 to produce several programs on the activities of the Union of Youth of the Union of Spiritual Communities of Christ. (Doukhobors). During the course of 1954-1955 Peter traveled with several other participants and recorded many hours of singing. Unfortunately the project was cancelled and the tapes were stored away. Fifty years later Peter found the taped material. The information was deteriating on the tapes, therefore had to be digitally restored and edited. The singing consists of several choirs and area groups who would gather to-gether and practice singing. The groups that you would hear are from the Kootenay area of Nelson, Castlegar and surrounding communities. Peter made these Cds 2 one hour each recordings for archival use and will make them available to those that wish to listen to them. These are down to earth songs sung by ordinary people and not by professional singers. These CDs were made possible by Advance Graphics Ontario. For more compehensive information about the Doukhobors, see Jon Kalmakoff's Doukhobour Genealogy website.